I picked up this story and picture from the New Zealand Herald News, reporter John Weekes, with thanks. Yet another springer spaniel sniffer dog job. That’s eight jobs and still counting. It’s great to see that the dog has a real Welsh name. Rhys Jones, a Welsh springer spaniel sniffer dog. “New Zealand’s first ant-sniffing canine is training for battle against hordes of Argentine invaders. Local biosecurity experts hope Welsh springer spaniel Rhys Jones will soon hunt Argentine ants. “He’s about halfway through his training and he’s ticking all the boxes,” said Auckland Council biosecurity manager Jack Craw. The dog’s trainer, Brian Shields, said Argentine ants were notorious for attacking native bird species. 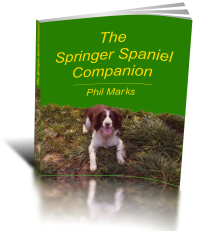 There’s another story here about springer spaniels being used to hunt termites attacking ancient buildings in South Korea. Enjoy! Springer Spaniel Dies from Broken Heart?